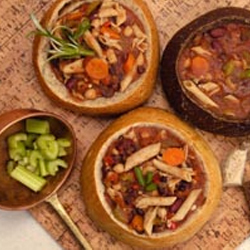 Great served in warm homemade bread bowls. See our recipe for Whole Wheat Bread Bowls. TIP: To lower the sodium content of this soup either purchase unsalted beans, or simply rinse the canned beans thoroughly before using. You can also purchase unsalted vegetable stock and tomatoes. As you can see by the recipe we have not ADDED any salt; only herbs and pepper as seasonings. In large soup pot combine everything except pasta, vinegar, and black pepper; bring to a boil over high heat; reduce heat to low and simmer, partially covered until carrots are tender crisp, stirring occasionally. Stir in vinegar and season with pepper. Serve in warm bread bowls if desired.